MARQUETTE — Hockey is a tight-knit community. We all don different jerseys, root for different teams and throw some trash talk at each other every now and then, but at the end of the day, we’re all fans who love the speed, sounds and camaraderie of the sport. Nobody was more true to the love of the game than Alan Ammesmaki, more commonly known as “Goofus,” who passed away one year ago today on March 27, 2018, at age 67. Goofus, an Ishpeming native and 1969 graduate of Negaunee High School, picked up on his love for hockey while attending Michigan State University from 1969-74, pursuing a degree in history before dropping out his junior year to work for Cleveland Cliffs Inc. in area mines. The long-time Spartans’ supporter always sported his green and white colors, and also gained a love for the Northern Michigan University hockey program in the Wildcats’ inaugural season in 1976. 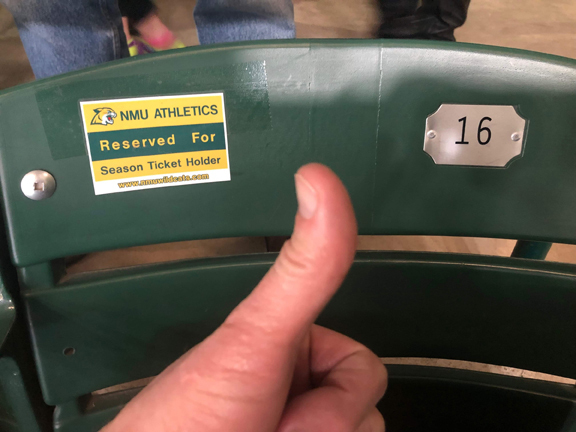 Goofus received a lot of flack from the NMU faithful when the Spartans came to town, cheering for his “original” favorite team over his newfound love for the Wildcats. Despite the sometimes conflict, Ammesmaki always found positivity in rooting for both his alma mater and his hometown team in the Upper Peninsula. 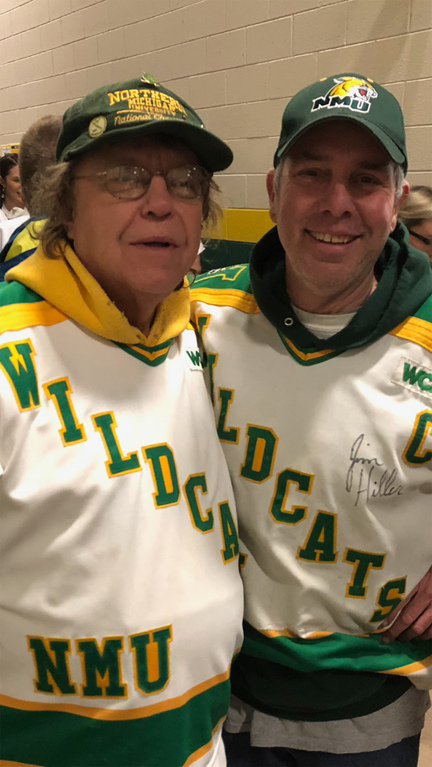 “(NMU) started hockey in 1976 and he went religiously to every game,” longtime friend and fellow Wildcats supporter Greg Pond said. “Some Northern fans kind of badgered him when State would play Northern because he was cheering for MSU. Ammesmaki, who got the nickname “Goofus” from a sixth-grade classmate who thought he had the traits of the mythical Goofus bird, was most famous for his “Polkacello,” an instrument that consisted of a mop handle, cymbals, horns, door springs, whistles, bells and everything in between. Her name was Betty. 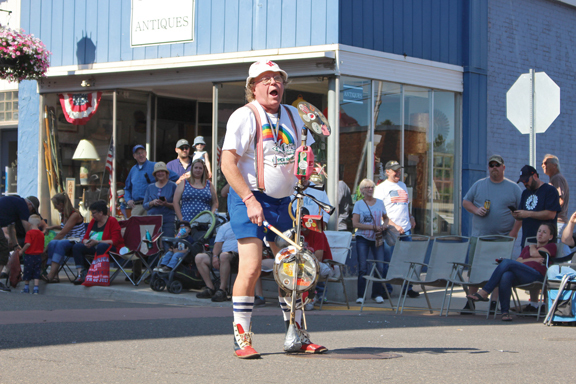 Goofus first performed with the instrument in July 1973, using it not only at hockey games, but in various community events over the years as well, such as Fourth of July parades and other local gatherings. The one-man band’s instrument was inducted into Michigan State’s Hall of Honor at the Munn Ice Arena last October, when the Wildcats played the Spartans in both teams’ season opener in East Lansing. Pond, who traveled to countless away games with Ammesmaki, has many fond memories of the Polkacello, noting the time it got stolen during a game at North Dakota in 1995 and how the the instrument had to be snuck in sometimes with the help of the NMU pep band. “A kid picked it up and ran off with it,” Pond said. “A North Dakota fan chased the kid down and he dropped it after he was closing in on him. Goofus and friends shared a close relationship with Comley and his players, particularly former NMU captain Morey Gare, who played for the Wildcats from 1982-85. Gare would sometimes let them into sold-out games through the locker room in the old days of a packed Lakeview Arena. In 37 seasons of watching the Wildcats together, the most memorable moments for Goofus and Pond was the 1991 national championship game in St. Paul, when NMU defeated Boston University 8-7 in triple overtime. Loyalty went unmatched as far as road games, with Pond also mentioning the time they were going on vacation and delaying it two days so they could watch the Wildcats play in the NCAA tournament in Providence, Rhode Island. His moonshot tradition consisted of showing off his green underwear with the words “Go ‘Cats Go” printed on them. At the 10-minute mark of the third period with the faceoff on their end of the rink, he shouted “Moonshot!” and counted down from 10, proceeding to pull down his pants and spin around as the crowd erupted into “Go ‘Cats Go” chants. And who could forget his “Go Northern” yodel, which echoed throughout Lakeview Arena and the Berry Events Center over the years. Amidst all of his crazy antics, Goofus only cheered, and never berated the other team. The only team he didn’t really like? The Michigan Wolverines. Goofus even said his favorite place to watch an away game was rival Michigan Tech. Goofus was even a Huskies fan at times, cheering for Tech and sporting black-and-gold gear at the 1982 Frozen Four in Duluth, Minnesota, setting the rivalry aside for his love of hockey and love of the Upper Peninsula. “He always cheered for a U.P. team,” Pond said, adding that included his beloved Negaunee Miners as well. Goofus’ first Frozen Four was in 1975 in St. Louis, watching the Huskies win their third national championship. He and Pond have been to several together since. With the 2018-19 Wildcats’ season complete, the first one without Goofus, Pond hopes to carry his positivity and love for hockey on for years to come. And Goofus’ community outreach lives on as well. “His Negaunee High School Class of 1969 voted him most likely to succeed, and he succeeded all right,” Pond said. “He succeeded at making people smile and keeping people happy. “He gave 25 to 30 different people boxes of Christmas presents around the holidays and he did that for several people. He bought canned food all year and brought several boxes to TV6 for the Canathon. While all we can do is share Goofus memories one year later, Pond doesn’t want his love for Northern to go unnoticed either. “He was always intermixing with all the fans. It didn’t matter what team you were cheering for. From the time the first puck dropped until the final buzzer, he was cheering for his team. He never booed the other team before the game started, during the game or after the game ended.